As soon as the clocks go back it’s like someone threw the light switch and the afterschool atmosphere changes. Instead of lamenting the lack of light we are making our own, transforming jam jars into beautiful candle holders to create a cosy glow in the kitchen as we play and eat dinner. 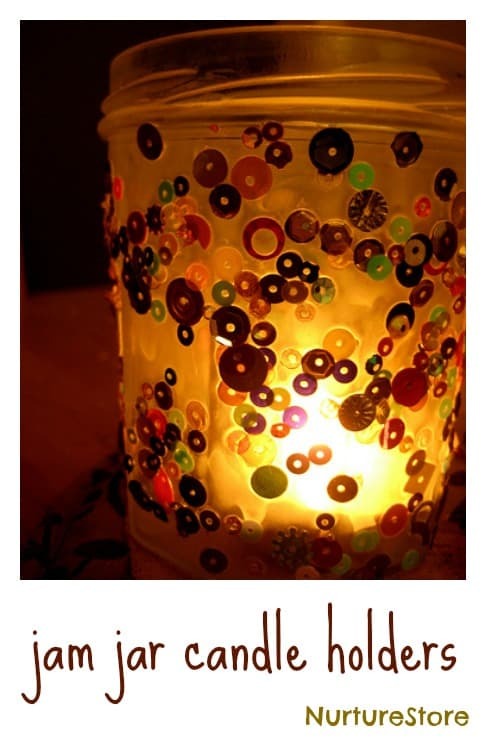 This is a good upcycling craft using old jam jars and we like to use ones with a wide neck, so it’s easier to place the tealights inside and light them. 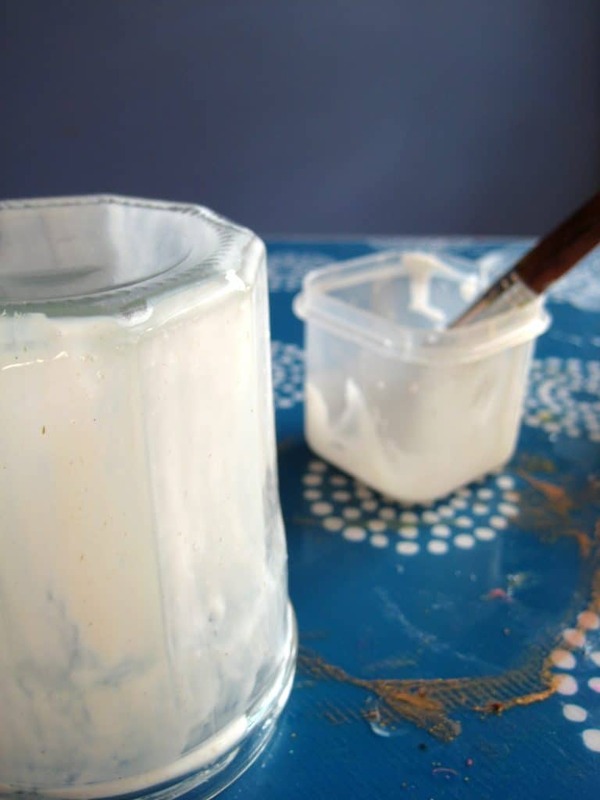 Start by thinning your glue with a little water, mixing it all together with your paintbrush. Then paint this mix over the outside of your jam jar. 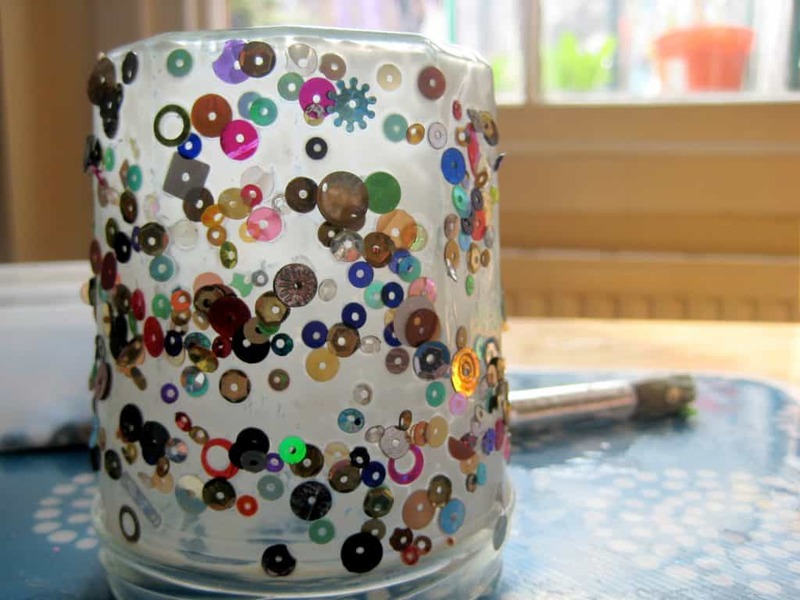 Add your embellishments and paint an extra layer of the watered down glue on top to hold everything in place, and provide a protective finish. 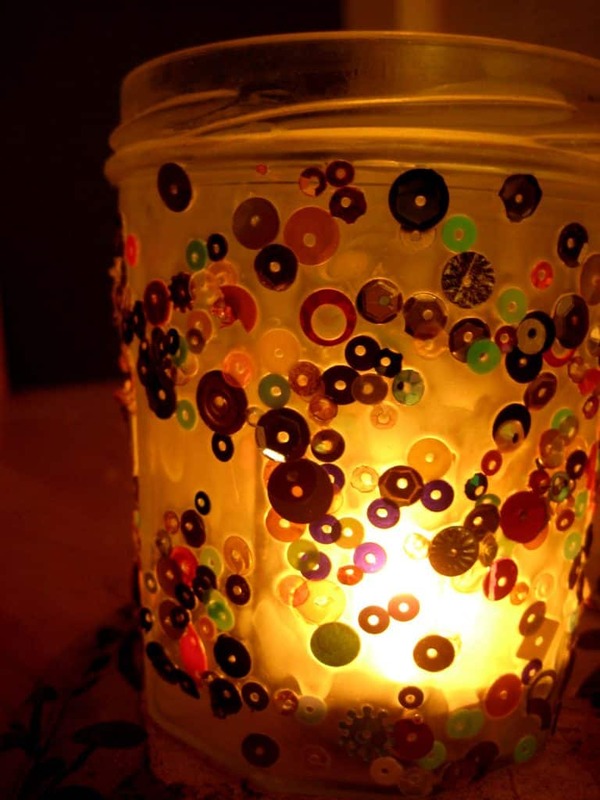 Once the glue is completely dry pop your tealight inside and sit back and enjoy the warm glow. Beautiful! I love the soft glow of tealight candle holders. Not only are yours beautiful while lit, I bet they’re beautiful sitting around the room without candles as well. Thanks for your comments. I love it too 🙂 Just what we needed to brighten up our kitchen. These are soooo beautiful – I love them! Ooh pretty! 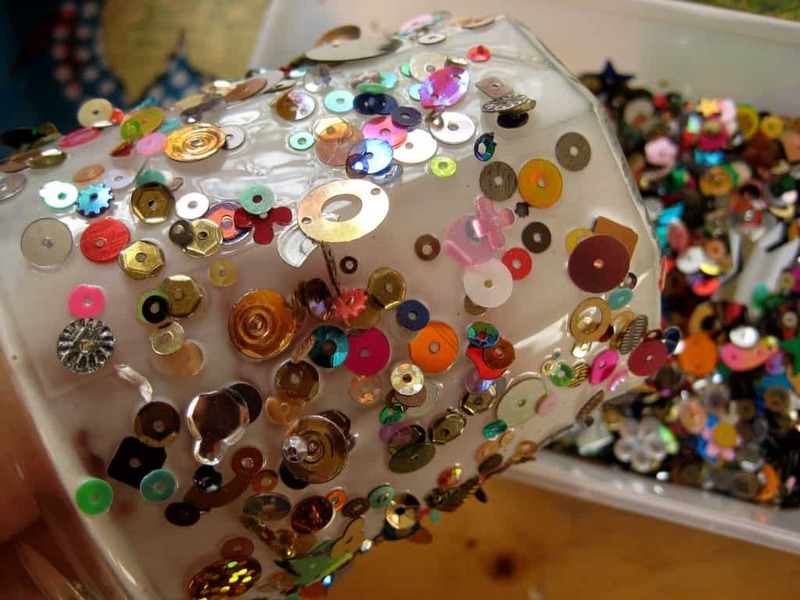 Great idea to use all those pretty sequins! What a fun craft, these little candle holders turned out very pretty! This would be a fun craft to try! 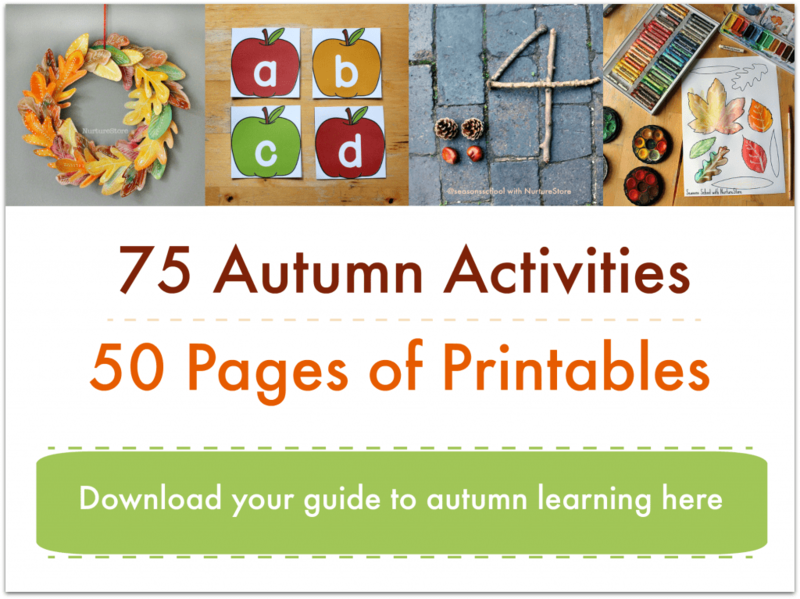 wow – this turned out so awesome! Cathy — this is lovely. Stopping by from the Sunday Showcase Linky Party! Really like your idea for the jam jar candle holders. They turned out so pretty! Bet it was a fun project enjoyed by all. Our entries for Sunday Showcase are Nature Walk and Mad for Matisse! Hope that you will pop by to see my blog, Sunrise Learning Lab. Have a nice week and hope that you will pop by my blog to say hello. this came out lovely & would make an awesome holiday gift for a grandparent, etc…. the wheels are turning now! many thanks for the inspiration & for sharing on the sunday showcase last week. I keep going back over and over all the comments because I remember looking at this and loving it and commenting, but alas no comment. I love this idea! I am so glad you put it on Monday Madness. I am now off to pin it! It seems my comments are never on peoples things I think I comment on and then if they link up to my post I look again and see I didn’t comment. I think it is just me having seen a post and wondering why I didn’t comment. I really liked this idea and thought I had said so but I guess I didn’t. By the way. I am featuring this tomorrow! Beautiful! What brand sequins did you use? I love the variety of shapes and colors! if you could post a website/link to purchase them that would be great! Hi Amy, the sequins are lovely aren’t they. They were just a random find in a pound store (dollar store) – lucky! 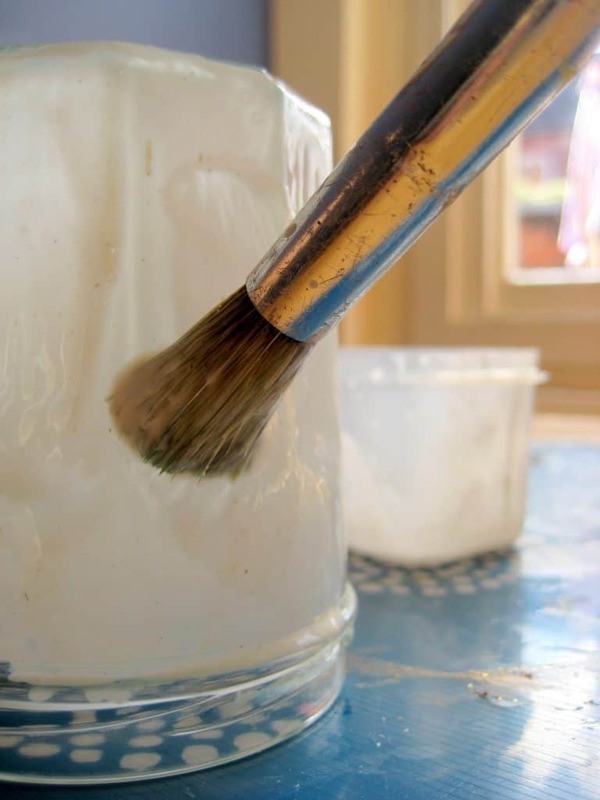 What is PVA glue and where do you buy it? Hi Yvonne. It’s the general-purpose, white craft glue that dries clear. This is lovely! I’m wondering what type of candle you use. I have heard that all but beeswax candles add to indoor air pollution, but I’ve also heard that beeswax burns much hotter, and I wasn’t sure if it would be appropriate to use in this type of jar. Any thoughts are welcome. Thank you!